I've had no problems with Reshade 3.0.7 up until I attempted to install custom effects and shaders. In an attempt to start from scratch I've reinstalled my game two times and installed Reshade 3.0.8. However, each time the DoF effects won't work. They blur the entire screen, including my character, and I'm not able to adjust the blurred background with my cursor like I previously could on an unedited 3.0.7. What exactly should I do? The DoF settings were the most important feature for me, and the constant crashing means my presets were never saved. EDIT: Tweaking the DoF settings now and managed to improve it some, but by default it considers my character the background until I enable DOF_MOUSEDRIVEN_AF and manually hover over him. There isn't anything wrong with the display depth, as it correctly identifies everything. Last Edit: 1 year 9 months ago by guppyo. Already read through the troubleshooting thread. I fixed my depth of field (which didn't have any issues covered in your linked thread as display depth worked, just needed to tweak settings) but I still have a problem with Reshade crashing each time I exit FFXIV. 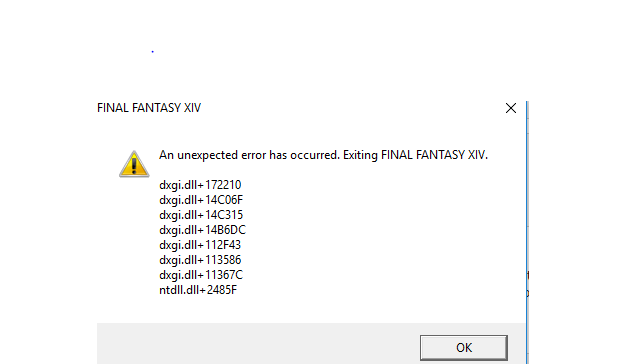 It does not happen when launching the game. Reshade launches with the game fine and works properly until I log out. I provided the exact error message within my post, it's not an issue with Reshade or overlays as I've tried multiple times with my Razer and GeForce overlays disabled and I haven't seen anyone else with this issue when I looked around.